Cable Protector Goalposts are GS6 compliant and used to warn vehicle traffic to the dangers of overh..
Cable Protector Goalposts are GS6 compliant and are used to warn vehicle traffic of the dangers of o..
Set of 2 Black coated steel as standard Usually weigh between 15-25kg One piece welde.. 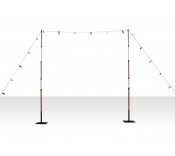 Solid telescopic crossbar is made in the sameway as the goalposts The crossbar is made from fib..
Site safety guidance is essential in the workplace. These systems addresses the issue of damage and harm caused by large vehicles and plant as it enters and moves around a work site. Overhead cable protection and low bridge passes are aided by using this portable gateway. The operator can simply and quickly erect this system across any carriageway or entrance with very little training. This prevents a common accident or personal injury effectively and at low cost. The equipment is very durable. It will last many years and many jobs. Some basic maintenance is required, but with the comprehensive warranties you are well supported so you get years of service from the product.